I meant to write about this last night but somehow became distracted by a movie. We are currently staying with our daughter in Clare in the mid-north of South Australia. Last night she showed us an interesting movie, one we hadn’t seen before, and the evening went without an update here. We arrived here two evenings ago after appointments in Mt Barker on the way. Our daughter had dinner ready for us when we arrived, so I left the unpacking of the car until later. As I braved the frosty air I noticed the moon rising over the nearby hills; one of those crisp, clear winter evenings so common in the Clare Valley – except that it is now early spring. Oh well. As I unloaded the car a Willie Wagtail called from a nearby garden, a common enough sound on moonlit nights. 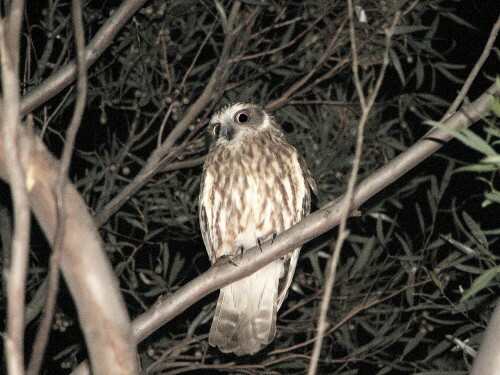 A few minutes later the Willie Wagtail’s call was accompanied by the distinctive “boo-book” call of the Southern Boobook Owl. It was probably calling from one of the larger eucalyptus trees in a nearby reserve. It was too cold – and I was too tired – to track it down to get a photo, so I’ve used one taken some time ago in our own garden.